Here you can discover the chemical processes going on inside your tablet. 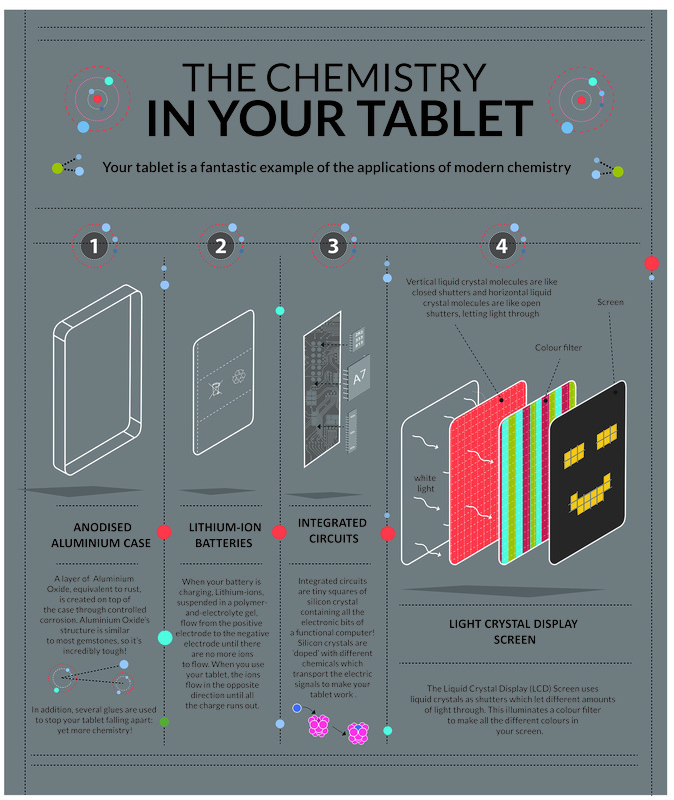 Your tablet is a fantastic example of the applications of modern chemistry. A layer of tough Aluminium Oxide, equivalent to rust, is created on top of the case through controlled corrosion. Aluminium Oxide’s structure is similar to most gemstones, which means your tablet won't shatter, as it's incredibly tough. In addition, several glues are used to stop your tablet falling apart: yet more chemistry! The Liquid Crystal Display (LCD) Screen uses liquid crystals as shutters which let different amounts of light through. This illuminates a colour filter to make all the different colours in your screen. Integrated circuits are tiny squares of silicon crystal containing all the electronic bits of a functional computer! Silicon crystals are ‘doped’ with different chemicals which transport the electric signals to make your tablet work. When your battery is charging, Lithium-ions, suspended in a polymer-and-electrolyte gel, flow from the positive electrode to the negative electrode until there are no more ions to flow. When you use your tablet, the ions flow in the opposite direction until all the charge runs out. Chemistry in your Tablet is brought to you by the Department of Chemistry's fantastic Schools Outreach Team, who bringing the excitement of chemistry to local primary and secondary schools.